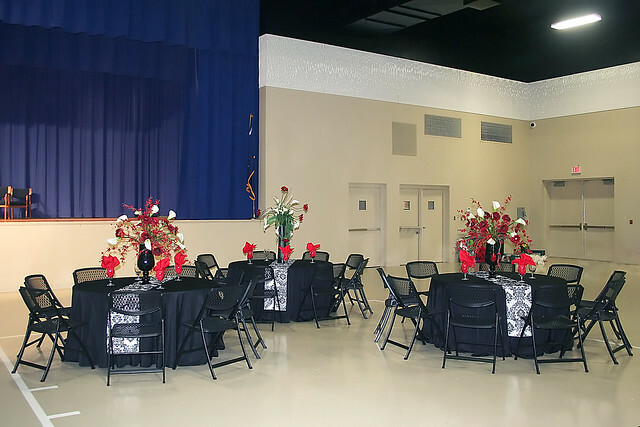 The James Medford Family Event Center on Piedmont Technical College’s Greenwood Campus offers 14,384 square feet of large event space and an optional 1,160 square feet of stage space. In addition, the facility also houses a kitchen area complete with ice machine, food warmer, refrigerator, and counter space for food prep. We do not restrict catering and can set up catering services for you upon request. A small classroom/staging area is also available at the rear of the building. Many high-tech amenities, including wireless internet access, are also available. Whether you are hosting a wedding reception or a corporate dinner, the Medford Event Center is sure to make your event stand out. For rates, upgrade information or to reserve space, download our reservation form.